This paper is concerned with formulating the requirements which must be fulfilled by a realistic theory of optical image evaluation, and with the analytical techniques which enable these requirements to be met to a greater or lesser extent. Some of the shortcomings of old and present-day methods of image assessment are enumerated and the above-mentioned requirements are outlined. 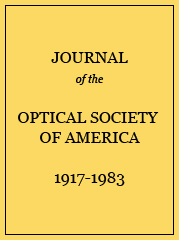 The Fourier treatment of optical images is extended to cover systems of fairly large aperture and field, working in polychromatic light, and the basic properties of their transmission factors (response functions) are developed. The evaluation of optical images and of optical designs is discussed in terms of these transmission factors.